Made in limited quantities with unheard-of ingredients, these things are next level. When the restaurant group behind Telegraph signed the lease on the space next door, what it was buying (besides prime Logan Square real estate) was a wood-fired oven. The question was how to get maximum benefit out of it. “I suggested wood-fired bagels,” recalls Katie Wyer, the pastry chef of Reno (2607 N Milwaukee Ave, 773-697-4234). “And everybody’s eyes kind of lit up.” She began researching recipes (including those for Montreal-style bagels, which are wood-fired), then adapting them, until she settled on her base ingredients (such as saffron-infused water for “nuanced flavor”) and an array of toppings, such as pumpkin seeds and olives. 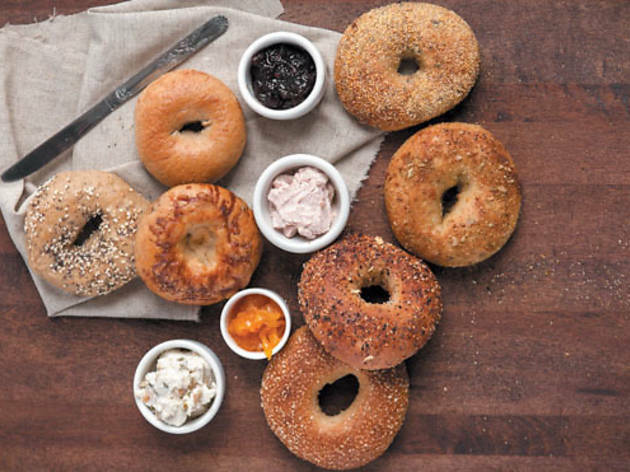 “To do an artisan bagel isn’t cheap,” says Wyer (Reno’s are $2.25 each), nor is it quick. 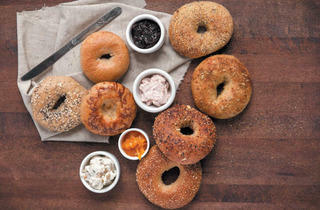 “We can only fire 16 [bagels] at a time,” hence the restaurant maxes out at 200 bagels on weekdays and 325 on weekends.